Challenger Deep, a part of Mariana’s Trench in the Western Pacific, is the deepest seafloor in the world. Mariana’s Trench is a subduction trench meaning it is the result of one plate (the Pacific plate) bending and descending below another (the Philippine plate). Challenger Deep is located at the southernmost part of the trench, around 10,920 m below sea level (Gvirtzman & Stern, 2004). The British exploring ship Challenger discovered the Challenger Deep on its 1873-1876 voyage (Nakanishi & Hashimoto, 2011). The southern part of Mariana’s Trench, where the Challenger Deep is located, is up to two kilometers deeper than the average depth of the trench (Gvirtzman & Stern, 2004). Scientists use bathymetry, which is a method to measure the depth of water. Bathymetric maps look very similar to topographic maps (Bathymetry, 2011). The primary reason the Challenger Deep has such extreme depth is a very narrow plate-coupling zone. This means there is weak coupling between the oceanic plate and the upper plate causing the oceanic plate to sink and steepen into a very deep trench (Gvirtzman & Stern, 2004). Challenger Deep is geographically located at the southern end of Mariana’s Trench, which is near the Mariana Islands group in the western Pacific Ocean. It is located between the Philippine plate and the Pacific plate. As seen in Figure 1, the Mariana Trench is associated with two different types of plate boundaries: a divergent plate boundary and a convergent plate boundary. The Mariana Ridge is located just northeast of Challenger Deep and is associated with the divergent plate boundary. Along the convergent plate boundary is the subduction zone. The closest body of land to Challenger Deep is Fais Island, a small raised coral island located southwest of the area (Gvirtzman & Stern, 2004). Figure 2 - Study area map of the Mariana Trench in the Western Pacific Ocean. The inner black square identifies the location of the trench. Key identifies different types of plate boundaries found on the map. Plate tectonics involve the formation, movement, and destruction of lithospheric plates. As plates move, they meet at plate boundaries. There are two different plate boundaries associated with the area around the Challenger Deep: a divergent plate boundary and a convergent plate boundary. 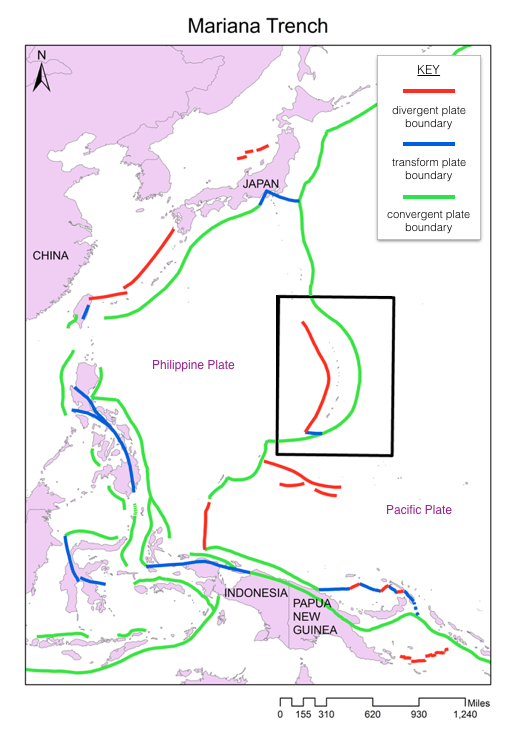 A divergent plate boundary occurs where two plates separate along a mid-oceanic ridge. In this case, it is the Mariana Ridge where seafloor spreading is occurring. A convergent boundary is where two plates move toward each other. When two oceanic plates come together, a deep oceanic trench, like the Mariana Trench, and an island arc is formed (Gvirtzman & Stern, 2004). The Mariana Trench is located directly adjacent to the oldest seafloor, the Pacific Plate. The southern part of the trench is up to two kilometers deeper than the average depth of the entire trench. More northern parts of the trench experience spreading centers similar to those of slow-spreading mid-oceanic ridges. On the other hand, the southern portion of the trench’s spreading center is inflated, behaving more like a fast-spreading ridge (Fryer, Becker, Appelgate, Martinez, & Edwards, 2003). 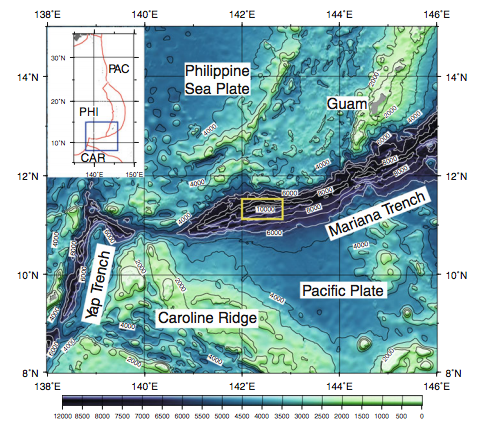 In the southern portion of the Mariana Trench, the subducted plate is only connected to the upper plate along a narrow surface. This weak plate coupling is one of the main reasons Challenger Deep is so deep. “Plate coupling” is the resistance of the plates to detach vertically at a subduction zone. The weak plate coupling causes the subducted plate in this area to sink faster and steepen more. The width of the plate-coupling zone and the weak attachment of the plates explain why there is such an extreme depth at this location in the trench (Gvirtzman & Stern, 2004). The Challenger Deep is part of a trend of deepening in the whole southern part of the trench. While the Challenger Deep gets deeper, the Mariana Ridge’s elevation increases in the southern part of the trench. This is caused when the overriding plate is released from the subducting plate and rebounds. The active and rapid steepening of the dipping causes extreme deepness. Steepening occurs due to simple gravitational sinking. It is faster because of the slab’s special hydrodynamic shape. This special shape allows the slab to move easier through the mantle because resistance to the mantle flow is reduced around the edges. Therefore, the slap retreats and steepens by its own weight (Gvirtzman & Stern, 2004). Bathymetry is the measurement of the depth of water. As seen in Figure 2, it looks similar to topographic maps with lines connecting lines of equal depth. Circles on a bathymetric map represent trenches or seamounts. Figure 2 shows that Challenger Deep is more than 10,000 meters below sea level. Its approximate depth is 10,920 meters below sea level. To create bathymetric maps, echo sounders are used to determine the topography of the seafloor. Scientists do this by recording the time taken for the pulse to leave and return to the ship. There are still many problems of accuracy and precision that exist with bathymetry. Some of these issues include the reflections from large sea animals; temperature, salinity, and pressure of the water; and ocean currents (Bathymetry, 2011). 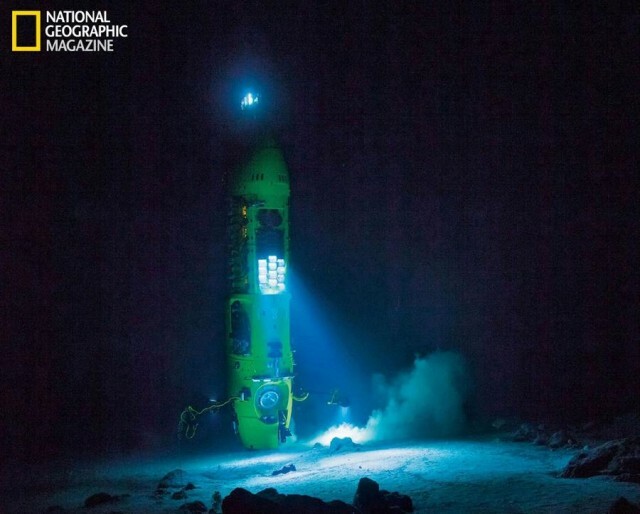 On March 26, 2012, famous movie director James Cameron took an expedition to the deepest part of the ocean, Challenger Deep. Squeezed into a small submersible, he ventured to the ocean floor with plenty of cameras to capture the unknown. Below is a trailer for the film based on Cameron’s expedition, Deepsea Challenge (Deepsea Challenge). The pictures and videos Cameron returned with have already helped scientists learn more about what lies in the depths of the ocean. The descending sub not only got a close-up look at the unique geologic characteristics of the trench, but also the biology (especially microbiology) that exists at such high pressures (Deepsea Challenge). James Cameron got to see up-close the location where two plate boundaries met. Here at such extreme depths, the earth is always moving causing the ocean floor to seem so smooth. Earthquakes occur frequently on the ocean floor causing a fresh layer of sediments to smooth out the surface. Scientists are looking at 3-D models collected by the sub to study how tsunamis form in deep ocean trenches. Cameron’s expedition has also given scientists a better insight on serpentinization, which is a process that may occur when two plates collide at a subduction zone. When the down-dragged plate is warmer than the other plate, trapped water can be forced through the plate to the ocean floor. This process releases hydrogen and methane springs (Deepsea Challenge)..
Scientists believe serpentinization could have created the first life forms. Microbial mats with early forms of life were found near Challenger Deep. At first glance these mats looked like stringy rock coating. They really held thousands of microbes, which are very small one-celled organisms. Microbes have the ability to live in extreme environments and give scientists lots of insight on the origins of life. These small cells have the ability to fix carbon dioxide in the dark and feed off of reduced sulfur. This has created the emerging theory that life could have started in areas similar to the modern-day Mariana Trench. Scientists also believe a new species of sea cucumber was discovered in the Challenger Deep, but cannot be sure until physical samples are collected. They are described as looking like a fat worm with feeding appendages; Figure 4 shows an image of a similar species discovered in the Gulf of Mexico. 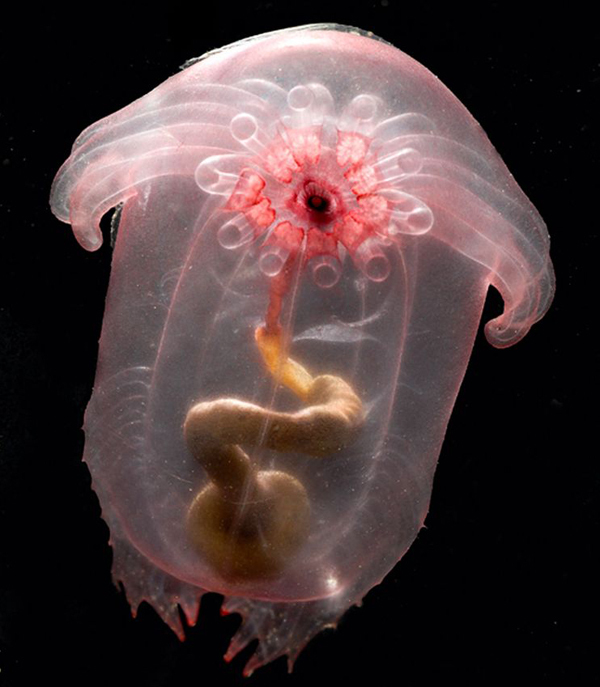 These creatures position themselves to allow deep-sea currents to deliver particles to their feeding tentacles. Scientists still hope to discover more about the strange organisms that live at such extreme depths (Deepsea Challenge). Challenger Deep in the Mariana Trench is the deepest point in the ocean. It was formed at a subduction zone between the Philippine and Pacific plates. Its deepness is the result of weak plate coupling. Compared to more northern parts of the Mariana Trench, the southern portion is notably deeper. The depth of the trench can be measured with bathymetry, although a completely accurate measurement is hard to achieve due to the extreme deepness. Scientists still hope to discover more about this deep, dark place in the ocean. De Blij, H., Muller, P., Burt, J., & Mason, J. (2013). Physical Geography (4th ed.). New York, New York: Oxford University Press. Fujioka, K., Okino, K., Kanamatsu, T., & Ohara, Y. (2002). Morphology and origin of the Challenger Deep in the Southern Mariana Trench. Geophysical Research Letters 29(10), 1-4. doi: 10.1029/2001GL013595. Gvirtzman, Z., & Stern, R. J. (2 April 2004). Bathymetry of Mariana trench-arc systemand formation of the Challenger Deep as a consequence of weak plate coupling. American Geophysical Union, 23(2), 1-15. doi:10.1029/2003TC001581. Nakanishi, M., & Hashimoto, J. (5 May 2011). A precise bathymetric map of the world’sdeepest seafloor, Challenger Deep in the Mariana Trench. Marine Geophysical Research, 32(4), 455-463. doi:10.1007/s11001-011-9134-0.